By does it make sense I mean whether it is at all legal, safe to an acceptable degree, technically possible (and at least a bit enjoyable) to use own canoe or kayak in the water canals of Venice. I'd love to bring my 4.5 meter (14 feet) long foldable open double kayak (see picture) to Venice and paddle around a bit with one other person aboard, who may not be much skilled. I myself have reasonable experience on still waters and rivers up to Class II with single kayak, double kayak and canoe (and am certified skipper for coastal sea waters, if that matters). I am in a decent physical condition, can paddle leisurely all day long or around 10 kilometers in one take on still waters. The boat is reasonably quick and agile, but not as stable as, for example, a typical sea kayak. I plan to use flotation vests, sport gloves and perhaps helmets as well (all being standard for other scenarios with similar water/stone ratio). I don't speak a single word Italian, I do speak English and German decently. My main concerns are tight spots that may prove too difficult to navigate too late, heavy water traffic, waves from bigger boats, and in case of an incident the apparently limited possibility to get out of water, depth and cleanliness of water and existence of currents that may turn a bit of a problem into a life threatening situation. I'd like to ask if somebody as already done this, seen this or knows anything relevant to this idea (local regulation, local news stories, even anecdotes are welcome). You may, but you do need to know in which canals the craft is allowed. 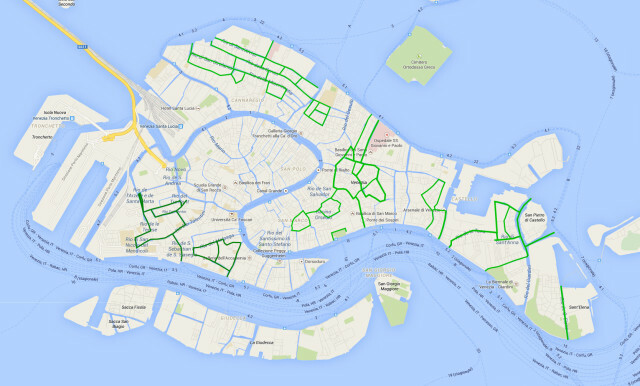 A Danish ex-pat, Rene Seindal, who operates Venice Kayak, as well as blogging, has a great post describing where kayaks are banned, and includes maps to guide you through the canals on which it is allowed. The Grand Canal is off limits, as are several others, and then there are many canals with other general traffic restrictions or which lead into a prohibited canal and are too narrow to turn around. If you're going to do this, you should probably just rent a boat there. That way you don't really have to worry about local regulations because the company that you rent from will take care of everything, not to mention that you won't have to lug around an actual boat through Italy. Also, just a word of caution. I could see myself paddling around Venice in a canoe, but many times of the year the water smells REALLY BAD. The canals are basically the sewer system for the city. So while it looks pretty, I would feel pretty gross running around in a kayak on the canals. Venice canal water is nasty. Remember this city does not have a sewage treatment plant. The wonders of the city are best explored on foot anyway, and the vaporetto network is extensive and cheap. I would not think it worth the bother. Not the answer you're looking for? Browse other questions tagged legal safety venice canoeing-and-kayaking or ask your own question.